Doses of Hope Foundation (DHF) is a non-governmental development organization based in Somaliland. The organization was first established in the Netherlands in November 1997 and was born out of the initiatives of a group of Somali women Diaspora living at that time in the Netherlands. 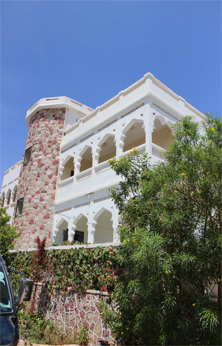 Subsequently in 1998 a local group incorporated an office in Somaliland which had its own board of directors and took the same name (Doses of Hope). DHFs program is focused on improving livelihoods by addressing the significant challenges facing the low-income, disadvantaged and vulnerable groups. DHF creates an environment that reinserts them back into the society in a sustainable and dignified way. Working with a wide spectrum of development organizations, the Somaliland government and the private sector, DHF strives to foster sustainable & resilient livelihoods for low income groups primarily, children, youth and women through (a) access to financial services, which is done through DHFs microfinance institution known as Kaaba Microfinance Institution (K-MFI), (b) provision of vocational & literacy trainings combined with market-oriented entrepreneurial skills and job creation, and (c) special needs education for the visually impaired children and young people. The emergence of local NGOs in Somaliland has been brought by social, economic and political ataclysmic upheavals of prolonged civil conflict, which led to the utter destruction of the country and the unraveling of its society. The local NGOs are only as old as Somaliland itself and bear the marks of this “forced birth” in many of their weaknesses. However they have also played an important role in rehabilitation and reconciliation programmes, and they have the potential to play an even greater role in the on-going development process of the country. significantly and effectively contribute, to the development and poverty reduction of their home country. Originally the idea behind the establishment of DHF was pioneered by Mrs Fadumo Alin (Founder and current Chairwoman) who fled the 1991 civil war in Somalia. The voice of Alin ‘let us do something about what happened to our country’ has soon attracted many people. Mrs. Alin was very angry at the Somali men for not only instigating the 1991 civil war in Somalia and the destruction of the country that followed but also how the war affected the Somali women who were and still are victims. Abandoned and left with the children, the women were forced either to be internally or internationally displaced, the senseless war has thrown them into a sea of uncertainty and insecurity. It is 24 years since Somaliland had taken the position of reverting to its own separate status and had declared an independent republic.